You might never guess it— based on Fort Collins, Colorado’s ubiquitous presence on every best place to live list ever published— but until 1969 you couldn’t drink gin in the city limits*. 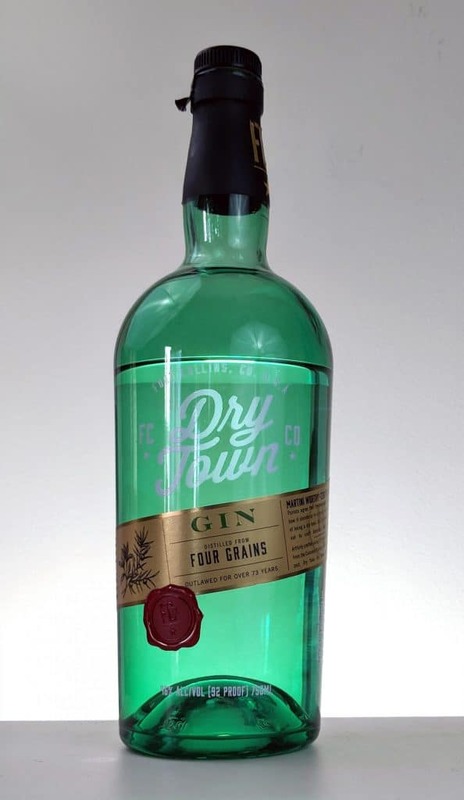 Very citrusy on the nose at first Dry Town Gin leads with a orange, sweet lime, then hints of lemon leaves and kaffir lime leaves. It opens up with a short time and a spicy, slightly Asian spice undertone emerges. I really enjoy the nose on this gin. The palate of Dry Town Gin is very bold. Juniper and lime rise early. Lots of citrus, suggesting both lemon and lime. Ginger spikes mid palate before notes of lemon verbena, pineapple sage bring a herbal counterpoint. A really nice balance. Towards the finish angelic and juniper lend a piney gravity as camphoraceous sage notes usher in what is a long and quite nice finish. Though the gin has a long stickiness on the palate, the spirit doesn’t have a ton of viscosity. It’s the botanical presence that gives Dry Town Gin it’s lasting power. Dry Town Gin is an ideal Contemporary style Martini gin. That’s because the journey that the botanicals go through on the palate— there’s a lot of depth and intrigue here that is delightfully complemented with a bit of bitterness and a twist. I’d suggest a dry Martini and go 8:1 and garnished with a twist. Old Elk Distillery’s gin offering is a solid cocktail gin is true to the team’s vision as described by Kate above. Dry Town pairs nicely with citrus juices and bitter amari. I’d suggest an Aviation, Corpse Reviver #2, or Monkey Gland. It’s a testament to the quality of the gin that it works in so many diverse applications. Dry Town Gin is a very successful cocktail gin that bartenders would be wise to take note of for those looking for a contemporary style gin cocktail. Dry Town is exciting, complex and unabashedly contemporary. Fans of classic styles will taste the juniper in here, but I’d more recommend this gin to those who are looking to move on from products like New Amsterdam or citrus flavored vodkas. ** I mean, what do you think the prohibitionists would have thought had they known that their movement would one day lend itself to a spirit?